I love biscuits. Isn't that a requirement of being truly Southern? 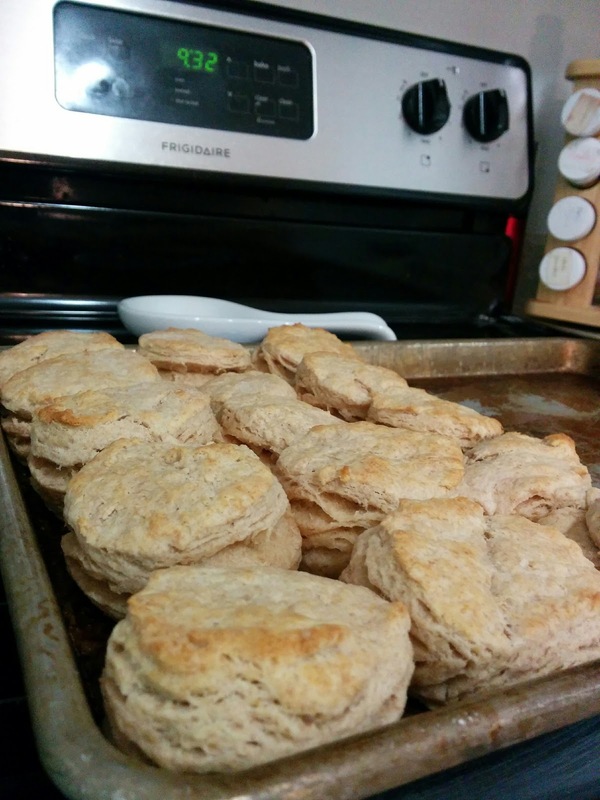 While I've never met a homemade biscuit I didn't want to devour, I've been working for years to perfect my biscuits and come up with THE best biscuit recipe I'd ever tasted. For a long time, our favorites were these Buttermilk Drop Biscuits—and while I totally love those, my one frustration was that they weren't very good for those days when I really wanted to cut a biscuit apart and slather it with strawberry jam. Enter these beauties. They are tall, tender, flaky, and layered, like biscuits from a fancy restaurant. And they are good. SO good. So good that the first time I made them I ate enough to give me a stomach ache. (I don't recommend that.) I suspect these biscuits will be the ones I'm making most often from now on! I did some experimenting in making these and threw the conventional biscuit wisdom (don't over-work the dough, etc.) out the window. I was nervous, but the picture speaks for itself! Preheat oven to 450. Mix together flour, salt, and baking powder. Grate in butter and mix with fork. Add one cup of cream and then continue adding until dough is moistened enough to hold together, but not wet. Turn onto floured countertop and knead once or twice to help dough hold together. Roll out with floured rolling pin, then fold into quarters and roll again. Repeat folding and rolling five or six times, until the dough is elastic and smooth, then roll to 1/2 inch thickness (yep, it's thicker than you usually would roll a biscuit—it's part of what makes these extra-good!). Cut biscuit rounds from dough and place onto a pan very close together, so that their edges touch (this makes them rise higher). Really cram them as closely together as you can! Bake 14-15 minutes or until golden-brown on top.